Ivory! A lot of people thought he’d be some sort of elephant but NOPE this is ARKANSAS he’s a woodpecker tee hee hee. Hey, do you like the comics I draw? Do you like stories about monster people? WELL GOSH do I have something EXCITING FOR YOU, THEN. WEIRD PETS is a collaboration between myself and Sfé Monster (who you might remember as the creator of Anthony, Blanche, Rupert, Royce, Phoenix, a bunch of other characters, and my BEST FRIEND IN THE WORLD). 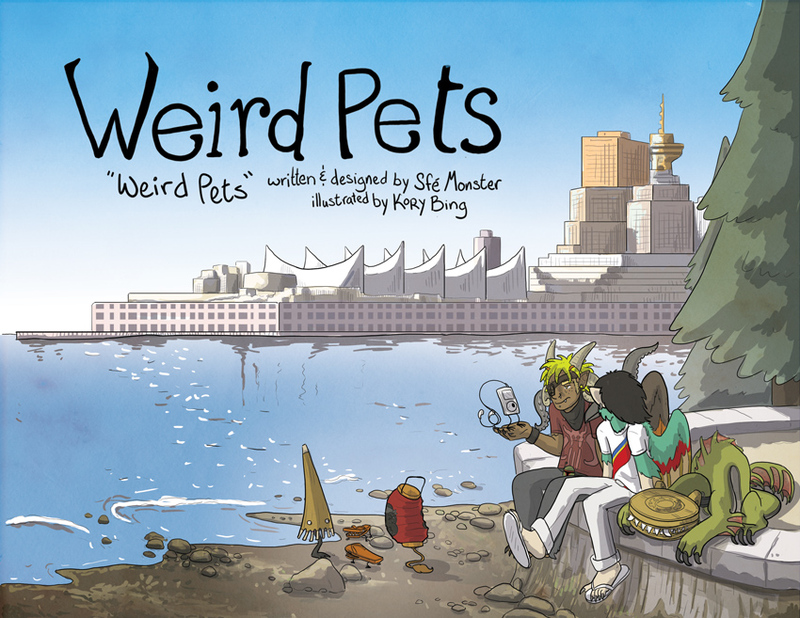 Weird Pets is a story about monster people living in an alternate version of Vancouver, Canada (“alternate” meaning “monster people live here too”). 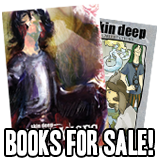 Sfé writes, designs, and lays out the comics and I draw them! There are two previous Weird Pets comics that you can read FOR FREE already, and there’s a BRAND NEW one up that you can buy a PDF of for a mere $5! If you pay anything over $5 you get the comic PLUS 5 swell Weird Pets desktop wallpapers. 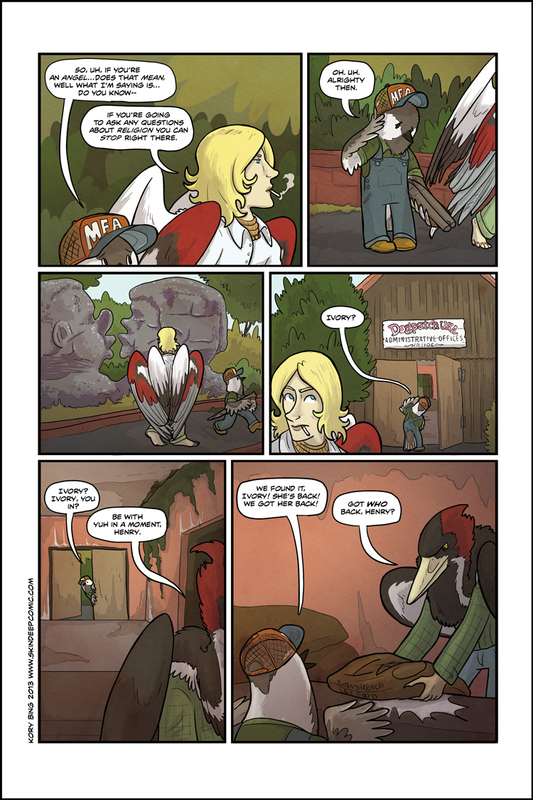 Once the funding goal is completely met, we’ll release the comic online FOR FREE, FOREVER, like the other two! I’m really proud of this one and if we make our goal there is another Weird Pets script ready to be drawn! So CLICK HERE to get your copy of WEIRD PETS: WEIRD PETS! An Ivory Billed Woodpecker. 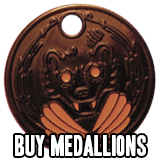 I think, it would make sense. And the colouring looks like one. Anyway, I was thinking possibly some sort of pig creature, or possibly a warthog or walrus totem (“Yeah, I met the Beatles…”). But yeah, it could have been anything. It does make sense from both their perspective and ours though – they’re tired of people asking and we get to fill in the blanks rather than be flat out told their world is one way or another works better for most people. Sad Hank makes me want to punch whoever made him frown, the little cutie! And is Ivory just being a jerk calling Hank “Henry”? Or am I going crazy by thinking his name was Hank in the first place? “Hank” is the common short form of “Henry” in parts of the US. Not just any woodpecker, but an EXTINCT woodpecker! I, too, hope that it’s not. I remember all the excitement a couple of years ago when someone heard ivory calls, but a population of only a few individuals is not viable. So in essence it’s near-mythical, which fits with the other characters here. Hey Kory? Why is it that Henry has wings for his arms, but Ivory has the wings on his back? Does it change between each creature? I think they can control how the mid form looks to a point. You have made me break my years-long lurk to scream EEEEEEE, IVORY-BILLED WOODPECKER! I sincerely hope it has not gone extinct. Ahm ‘spectin to see Abner or Daisy Mae soon. Or maybe Stupefying Jones. That’d be sumpin.